Gerty, had some work trips scheduled in Germany so we decided to ride our motorcycles and make a bit of a first tour of it. Gerty, had some work trips scheduled in Germany so we decided to ride our motorcycles and make a bit of a first tour of it. We had two nights in Weimar and 3 nights in Potsdam booked for Gerty's work and tacked on three extra nights to get there and back. In the usual fashion we had got off to a late start so our goal was to get as far as possible towards Weimar as we could. This involved taking some major roads. We soon found our selves on a autobahn. This was a bit of a foreign concept so we spent some time sussing it out but once we had worked out the rules we were soon travelling at 140 to 160kph most of the time. What a hoot. I even got the F700gs up to its maximum speed of an indicated 205kph that the GPS measured at 195kph. This later figure aligns with the stated BMW max speed. To reach this I had it pinned (no more twist in the throttle) and had to lay flat on the tank to avoid the wind and also to place extra weight on the front of the bike to stop it wobbling. I even had to ride one handed to stop the wind buffeting feeding back into the steering. Apart from being adrenaline filled max speed fun travelling at this speed is tiring so 140 -150 became our average. I did learn pretty quickly that the 700s windshield has to go, its far to inefficient for highway travel. At a coffee break we had booked a motel on line at Wittenberg. Which seemed about half way to Weimar. 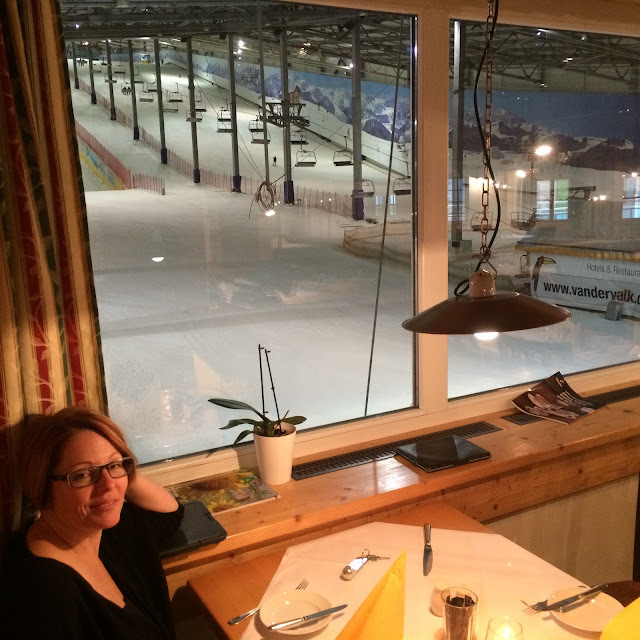 We had no idea what his place was about but when we arrived we realised we had booked into a year round indoor ski centre. 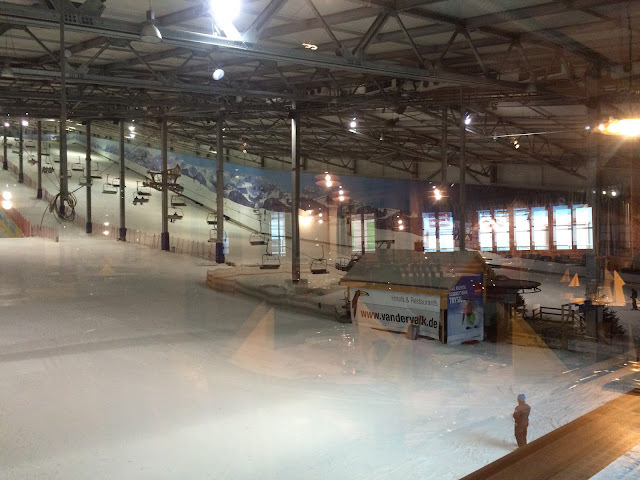 Outside it looked like a big shed in an industrial area, inside however people were tromping around in ski gear having après ski drinkies etc like any other ski resort. After a quick kip we dined overlooking people skiing well into the evening. My meal consisted of schweinaxel and beer with Kraut and potatoes. Brilliant. What a cool and bizarre place.